Ito K, Dezaki K, Yoshida M, Yamada H, Miura R, Rita RS, Ookawara S, Tabei K, Kawakami M, Hara K, Morishita Y, Yada T, Kakei M.: Endogenous α2A-adrenoceptor-operated sympathoadrenergic tones attenuate insulin secretion via cAMP/TRPM2 signaling. Diabetes 66(3): 699-709, 2017. Nakata M, Yamamoto S, Okada T, Yada T.: AAV-mediated IL-10 gene transfer counteracts inflammation in the hypothalamic arcuate nucleus and obesity induced by high-fat diet. Neuropeptides 62: 87-92, 2017. Santoso P, Nakata M, Shiizaki K, Boyang Z, Parmila K, Otgon-Uul Z, Hashimoto K, Satoh T, Mori M, Kuro-O M, Yada T.: Fibroblast growth factor 21, assisted by elevated glucose, activates paraventricular nucleus NUCB2/Nesfatin-1 neurons to produce satiety under fed states. Scientific reports 7: 45819, 2017. Suyama S, Lei W, Kubota N, Kadowaki T, Yada T.: Adiponectin at physiological level glucose-independently enhances inhibitory postsynaptic current onto NPY neurons in the hypothalamic arcuate nucleus. Neuropeptides 65: 1-9, 2017. Sasanuma H, Nakata M, Kumari P, Nakae J, Yada T.: PDK1-FoxO1 pathway in AgRP neurons of arcuate nucleus promotes bone formation via GHRH-GH-IGF1 axis. Mol Metab. 6(5): 428-439, 2017. 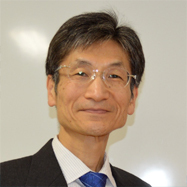 Yoshii Y, Inoue T, Uemura Y, Iwasaki Y, Yada T, Nakabeppu Y, Noda M.: Complexity of stomach–brain interaction induced by molecular hydrogen in Parkinson’s disease model mice. Neurochem Res. 42(9): 2658-2665, 2017. Iwasaki Y, Goswami C, Yada T.: Glucagon-like peptide-1 and insulin synergistically activate vagal afferent neurons. Neuropeptides 65: 77-82, 2017. Suyama S, Ralevski A, Liu ZW, Dietrich MO, Yada T, Simonds SE, Cowley MA, Gao XB, Diano S, Horvath TL. : Plasticity of calcium-permeable AMPA glutamate receptors in Pro-opiomelanocortin neurons. Elife 6: e25755, 2017. Loh K, Shi Y, Walters S, Bensellam M, Lee K, Dezaki K, Nakata M, Ip CK, Chan J, Gurzov E, Thomas H, Waibel M, Cantley J, Kay T, Yada T, Laybutt R, Grey S, Herzog H.: Inhibition of Y1 receptor signaling improves islet transplant outcome. Nature Communications 8(1): 490, 2017. Ota M, Yoshida S, Nakata M, Yada T, Kunugi H.: The effects of adjunctive intranasal oxytocin in patients with schizophrenia. Postgrad Med. 130(1): 122-128, 2017. Iwasaki Y, Sendo M, Dezaki K, Hira T, Sato T, Nakata M, Goswami C, Aoki R, Arai T, Kumari P, Hayakawa M, Masuda C, Okada T, Hara H, Drucker DJ, Yamada Y, Tokuda M, Yada T.: GLP-1 release and vagal afferent activation mediate the beneficial metabolic and chronotherapeutic effects of D-allulose. Nature Communications 9(1): 113, 2018. Okamoto S, Sato T, Tateyama M, Kageyama H, Maejima Y, Nakata M, Hirako S, Matsuo T, Kyaw S, Shiuchi T, Toda C, Sedbazar U, Saito K, Asgar NF, Zhang B, Yokota S, Kobayashi K, Foufelle F, Ferré P, Nakazato M, Masuzaki H, Shioda S, Yada T, Kahn BB, Minokoshi Y.: Activation of AMPK-regulated CRH neurons in the PVH is sufficient and necessary to induce dietary preference for carbohydrate over fat. Cell Rep. 22(3): 706-721, 2018. Ando A, Gantulga D, Nakata M, Maekawa F, Dezaki K, Ishibashi S, Yada T.: Weaning stage hyperglycemia induces glucose-insensitivity in arcuate POMC neurons and hyperphagia in type 2 diabetic GK rats. Neuropeptides 68:49-56, 2018. Goswami C, Iwasaki Y, Yada T.: Short chain fatty acids suppress food intake by activating vagal afferent neurons. J Nutr Biochem. 57:130-135, 2018. Meguro Y, Miyano K, Hirayama S, Yoshida Y, Ishibashi N, Ogino T, Fujii Y, Manabe S, Eto M, Nonaka M, Fujii H, Ueta Y, Narita M, Sata N, Yada T, Uezono Y. Neuropeptide oxytocin enhances μ opioid receptor signaling as a positive allosteric modulator. J Pharmacol Sci. S1347-8613(18)30065-3, 2018. Kumari P, Nakata M, Zhang BY, Otgon-Uul Z, Yada T. GLP-1 receptor agonist liraglutide exerts central action to induce β-cell proliferation through medulla to vagal pathway in mice. Biochem Biophys Res Commun. 499(3):618-625, 2018. 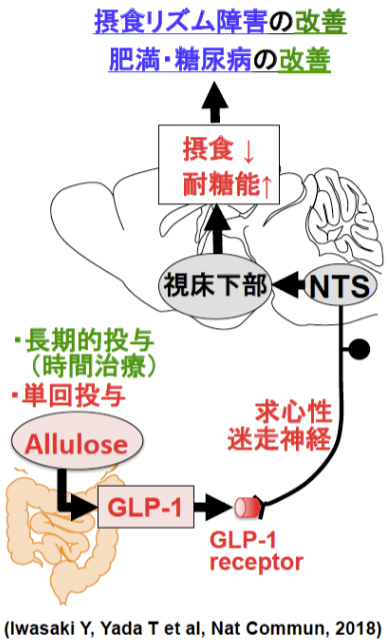 Zhang B, Nakata M, Lu M, Nakae J, Okada T, Ogawa W, Yada T. Protective role of AgRP neuron’s PDK1 against salt-induced hypertension. Biochem Biophys Res Commun. 500(4):910-916, 2018. Katsurada K, Yada T.: Neural effects of gut- and brain-derived glucagon-like peptide-1 and its receptor agonist. J Diabetes Investig. Suppl 1: 64-69, 2016. Kakei M, Yoshida M, Dezaki K, Ito K, Yamada H, Funazaki S, Kawakami M, Sugawara H, Yada T.: Glucose and GTP-binding protein- coupled receptor cooperatively regulate transient receptor potential-channels to stimulate insulin secretion. Endocr J. 63(10): 867-876, 2016. Uchida K, Dezaki K, Yoneshiro T, Watanabe T, Yamazaki J, Saito M, Yada T, Tominaga M, Iwasaki Y.: Involvement of thermosensitive TRP channels in energy metabolism. J Physiol Sci. 67(5): 549-560, 2017. Toshihiko Yada, GLP-1 secretion and vagal afferent mediate anti-diabetes/obesity effects of rare sugar D-allulose. Asia Isslet Biology & Incretin Symposium, Soul, Korea, AUG 2-4 2018. Copyright(C) Kansai Electric Power Medical Research Institute (KEPMRI). All Rights Reserved.